The second of three images of ESO’s GigaGalaxy Zoom project is a new and wonderful 340-million-pixel vista of the central parts of our galactic home, a 34 by 20-degree wide image that provides us with a view as experienced by amateur astronomers around the world. Taken by Stéphane Guisard, an ESO engineer and world-renowned astrophotographer, from Cerro Paranal, home of ESO’s Very Large Telescope, this second image directly benefits from the quality of Paranal’s sky, one of the best on the planet. The image shows the region spanning the sky from the constellation of Sagittarius (the Archer) to Scorpius (the Scorpion). 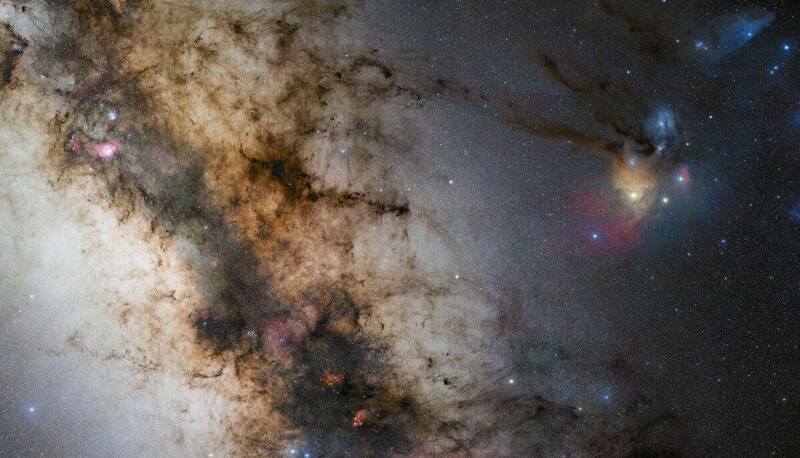 The very colourful Rho Ophiuchi and Antares region features prominently to the right, as well as much darker areas, such as the Pipe and Snake Nebulae. The dusty lane of our Milky Way runs obliquely through the image, dotted with remarkable bright, reddish nebulae, such as the Lagoon and the Trifid Nebulae, as well as NGC 6357 and NGC 6334. This dark lane also hosts the very centre of our Galaxy, where a supermassive black hole is lurking. The image was obtained by observing with a 10-cm Takahashi FSQ106Ed f/3.6 telescope and a SBIG STL CCD camera, using a NJP160 mount. Images were collected through three different filters (B, V and R) and then stitched together. This mosaic was assembled from 52 different sky fields made from about 1200 individual images totalling 200 hours exposure time, with the final image having a size of 24 403 x 13 973 pixels. Note that the final, full resolution image is only available through Stéphane Guisard.